Place 100g essential Waitrose long grain rice, 400ml can essential Waitrose half fat coconut milk and 200ml water in a saucepan. Bring to a simmer and cook, stirring occasionally, for 30 minutes, until the rice is tender. Meanwhile, peel and slice 3 kiwis. In a small bowl or ramekin,combine 2 tsp essential Waitrose pure clear honey with ½ tsp boiling water from the kettle. Grate in the zest of ½ lime and drizzle over the slices of kiwi. 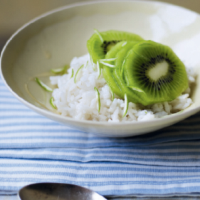 Serve the rice pudding topped with the honeyed kiwi.